A better world is being formed out there – and we want to share it with you. We’ve sourced a fine coffee through Cooperative Coffees and the Muungano Cooperative in the Democratic Republic of the Congo. This 89-point offering has a lemongrass tingle, a deep dark chocolate flavor, and a pleasant bergamot acidity. But this coffee is important for more than its stunning flavor. For one, it’s Fair Trade Certified and provides greater wages for the farmers involved. We’re also donating a portion of the profits from this coffee to Project Congo, an effort by On The Ground, to support gender equality projects in the surrounding areas. Lives in the DRC are being changed in some dramatic ways through this coffee and others like it. Want to see how? The Democratic Republic of the Congo achieved independence from Belgium in 1960. However, rights, respect, and independence continues to be a struggle for women of the nation. According to research conducted by Project Congo, women make up roughly 80% of coffee farm labor in the country. Cultural norms often keep women from making any financial return on their hard work. The 2007 DRC Demographic and Health Survey discovered that nearly 1.8 million women in the nation have been the victims of sexual assault, and another 3.37 million have suffered sexual violence by the hands of their partners. The United Nation dubs the DRC the “most dangerous country to be a woman”. On The Ground’s Project Congo has partnered with the Muungano Cooperative to offer GALS (Gender Action Learning System) training and counseling to the men and women who work in the region. By revealing the benefits of husbands and wives working as a team to earn and save money, planning together financially, and reducing violence to improve cooperation and prosperity, these GALS trainings have already made a massive impact in the lives of over 600 participants. The home lives of hundreds are becoming more peaceful and fruitful. Sexual violence is being subdued by education and partnerships with local hospitals. Credit and savings groups are helping communities learn to earn, save, and plan together. Increased gender equality is improving the health and sustainability of families and larger communities in many ways, but don’t take our word for it. Allow us to introduce you to some of our neighbors. 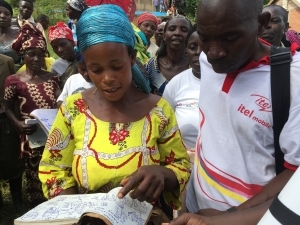 Before she attended a GALS training, Rachel watched as her husband spent money without a plan. Like many in her region, she would rise early to work while her husband enjoyed beer and time with friends. Thanks to the compassionate and insightful work of On The Ground’s GALS training, things have turned around for Rachel and her family. Bajuwe describes his former life as “an animal’s life”. He was just going through the motions: physically mistreating his family, allowing his wife to do most of the work, and generally not enjoying his circumstances. Then he and his wife visited a local GALS training and everything changed. Bajuwe’s family hopes to soon be able to purchase an iron sheet home, continue to save money, and send all his kids to school. These men and women aren’t just our coffee suppliers. They’re our friends and neighbors. Their gain is our gain. Their joy is our joy. The desire to see our neighbors around the world grow and thrive is deeply rooted in everything we do, which is why we sourced this Fair Trade coffee and donate a portion of the sales from our Muungano Cooperative offering to On The Ground’s gender equality efforts. Gender equality has profound effects on communities large and small, and we’re ecstatic to be able to play a role in this work. If you’d like to participate with us in the cultural revival that’s happening in the Democratic Republic of the Congo, check out our Muungano Cooperative coffee or see other ways you can get involved.